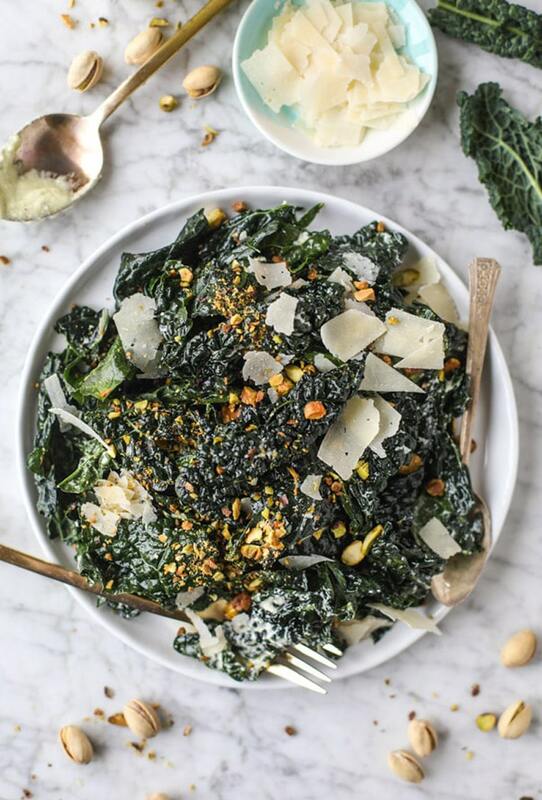 Place the kale leaves in a large bowl. Drizzle with the olive oil and massage the oil into the leaves. Let the kale sit while you make the dressing. In a food processor, combine the cheese, yogurt, garlic, mustard, vinegar, lemon juice, salt and pepper. Blend until pureed. With the processor still on, stream in the olive oil until a creamy dressing forms. [This will make more dressing than needed, but you can store it sealed in the fridge for about 3-4 days and stir well before using.] Drizzle a few tablespoons of the dressing over the kale and toss it well so the dressing is evenly dispersed. Cover with the chopped pistachios and shaved parmesan and serve.